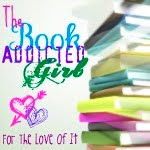 I guest posted about my favorite historical fiction novels at The Book Addicted Girl today. Check out my post and Megan's blog! She's doing a Fortnight of Guests series. Awesome! Going to check it out!